I finished another sample. Yeah! 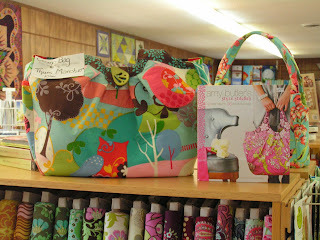 I stitched up the Cosmo bag from amy butler's book: "amy butler's style stitches". The instructions and techniques are good. I am looking forward to sewing some of the other bags in this book. 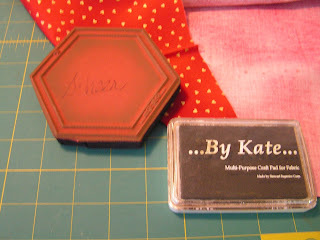 I used "it's a Hoot" fabric from Moda fabrics. The bag is big enough to hold a finished quilt and would make a great weekend bag. Slowly but surely things are getting done. 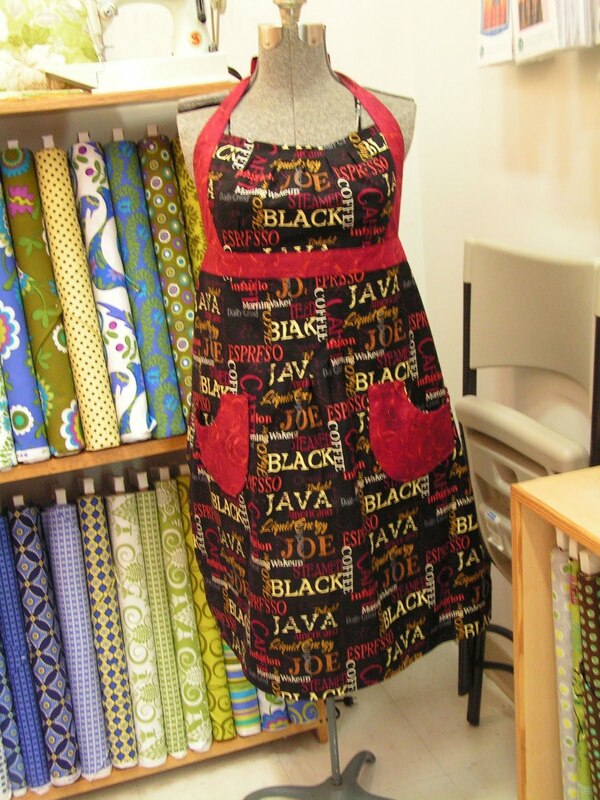 The apron is from an Amy Butler pattern. It looks great on slender figures that can wear empire waistlines. 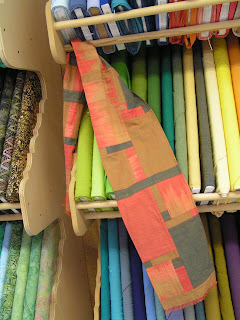 The scarf is sewn with Pojagi seams that remind me of flat felled seams. Another cold, snowy day in NE Tennessee. Sewing at home today. 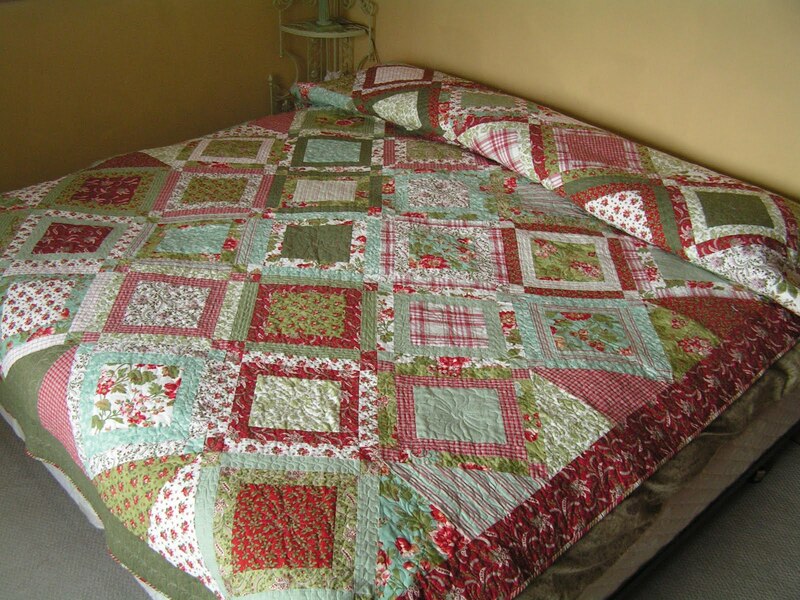 I finished binding a Christmas quilt I had started for my mother a few years ago. I can't believe it is finally done. Yeah! I also finished piecing the Valentine, hexagon, topper for a round table. The color did not show well in my picture. 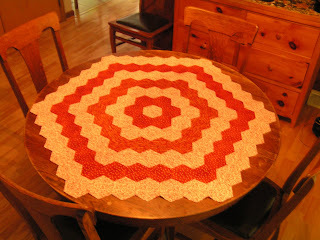 I have started another hexagon topper for a rectangular or oval table. My daughter-in-law recieved "The Dirty Life" by Kristin Kimbal for Christmas from her mother. After she read it, she left it for me to read. I love the book and recommend it to anyone who loves farming. If you google Kristin Kimbal you will see a video clip about her farm as well as interviews about the book. More snow is falling. ETSU is not having classes today because of the road conditions. It's not that we have so much snow as it is slick. So, no quilt shop work for me today, another day of sewing at home. There is a new hexagon rubber stamp being sold at TN Quilts. Each side measures 2 inches after it is sewn. 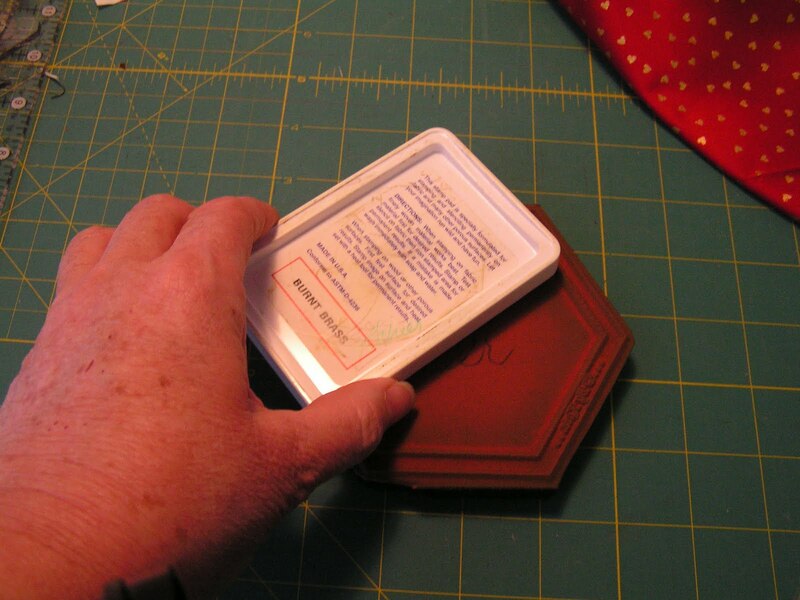 I usually hand piece to smaller hexagons but these are large enough that I can easily piece them by machine. 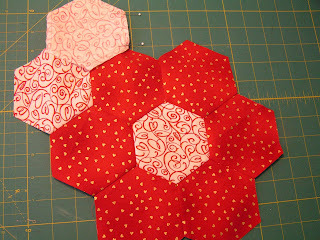 I am working on a hexagon that will be used on our round dining table for Valentine's decoration. 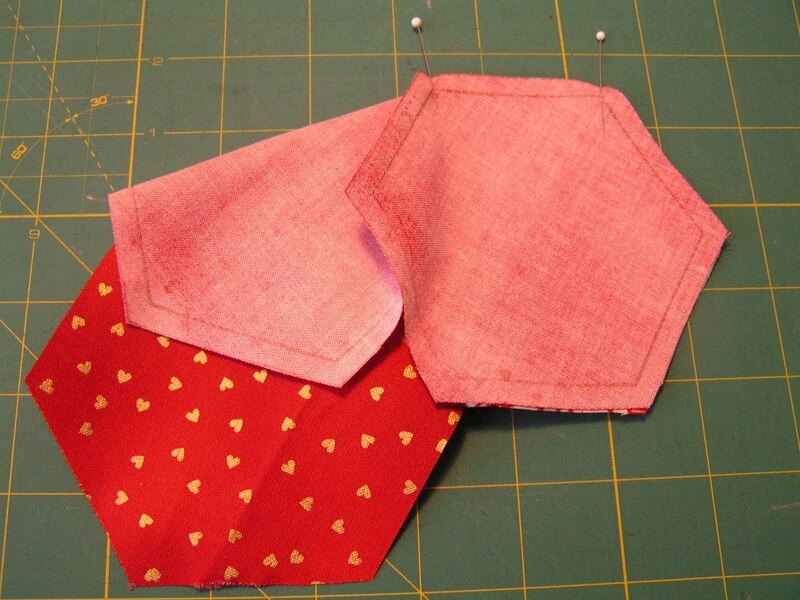 When sewing by machine, I still stop and start where the seams intersect. Another snow day home from the quilt shop. I am glad to have the time to catch up on my sewing for upcoming classes. 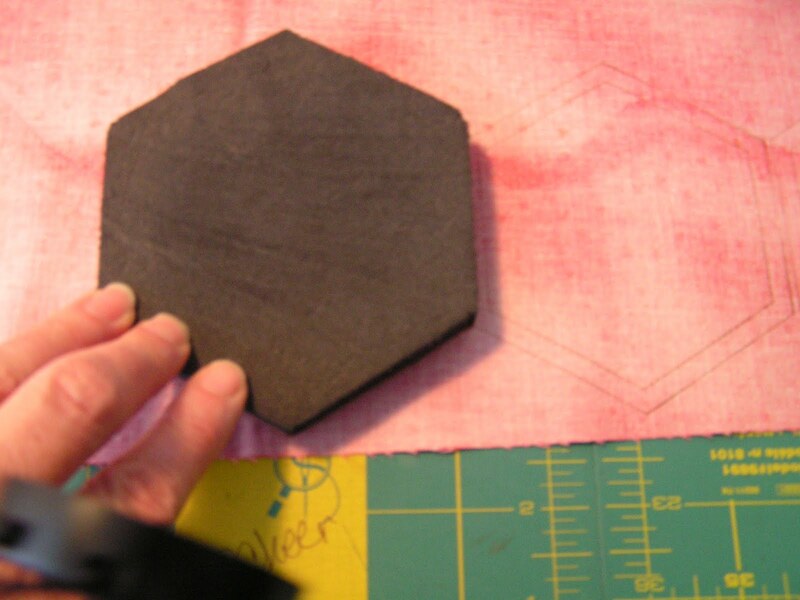 The first thing under the presser foot is the shop challenge of the Judy Neimeyer paper pieced Glacier Star. 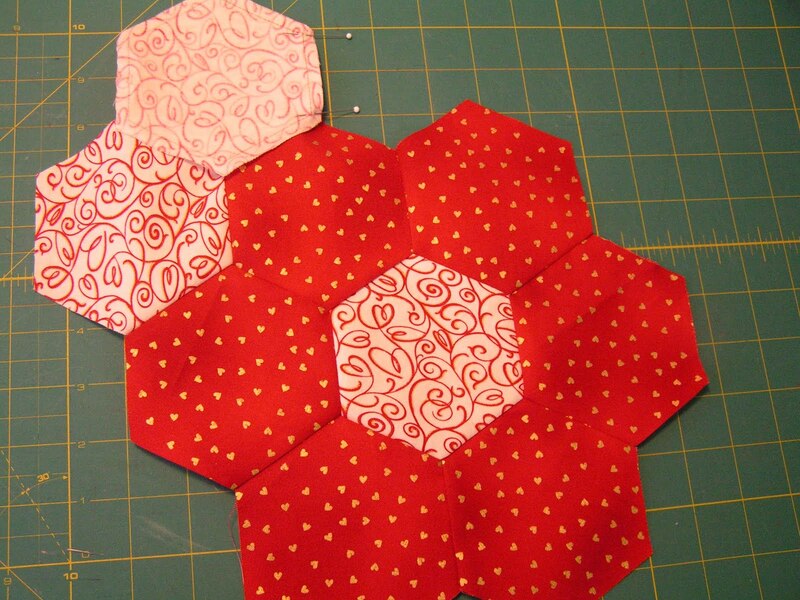 I have paper pieced in the past and even taught a beginner class but this one is a challenge! The dust has settled and the rafters have stopped ringing, but oh what a good time was had by all. We will remember our grandson's insistant "on" the first thing in the morning as we plugged in the Christmas lights spread around the house. 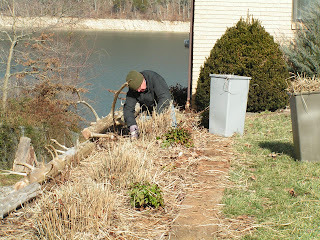 Then "on" as Opa lit the fire in the basement wood stove. We will remeber shopping and playing games with our grandaughter. She also slept between us each night. Lots of cooking with everyone involved. I hope to have a way to once again share pictures with you. I have so many things to show and tell. Happy New Year and may it be your best yet!